The triversen ("triple verse sentence") is a verse form invented by William Carlos Williams. Each stanza is composed of a single sentence, broken into three parts, which together form a stanza. The poems are generally unrhymed and often contain alliteration. They can be composed of any number of tercets. You can learn more about the triversen and read some examples at Poetics and Ruminations. So, there's your challenge for the week. I hope you'll join me in writing a triversen. Please share a link to your poem or the poem itself in the comments. So, there's your challenge for the week. I hope you'll join me in writing a wayra. Please share a link to your poem or the poem itself in the comments. Akshar-Mala is an Indian poetic form in which the initial letters of each line are in alphabetical order. There are no other requirements for the form. I found this form in The Dictionary of Indian Literature, One, Beginnnings-1850. I haven't been able to find any other descriptions of it, or any another Indian form that resembles it closely. A while back we wrote in the form of iroha mojigusari, where the first letter of the alphabet starts off the first line and the second letter of the alphabet concludes it. The third letter starts the second line and the fourth letter finishes it. This continues until all the letters of the alphabet have been used in order. Since there are no other guidelines here than order, I don't see why you can't begin with any letter of your choosing and make the poem as long as you like. So, there's your challenge for the week. I hope you'll join me in writing an akshar-mala. Please share a link to your poem or the poem itself in the comments. 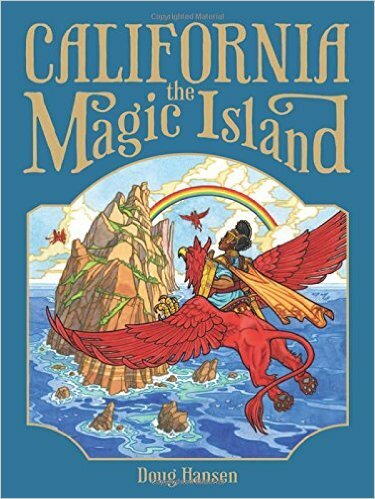 California, the Magic Island, written and illustrated by Doug Hansen, is a book that every California teacher should have on his/her bookshelf. But what is it? Is it mythology? State history? Alphabet book? Actually, it's all of the above. Here's the overview from the back cover. Queen Calafia, the legendary heroine of a sixteenth-century Spanish romance about an island overflowing with gold, is incensed with she hears that a state has been named after her. Being the good queen that she is, she's willing to hear from twenty-six animals about why California is worthy of her regal name. 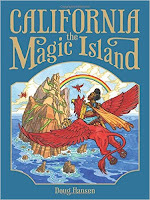 Each animal describes an iconic cultural object or historical event, enchanting readers—and maybe even Calafia herself—with their tales of the magical place called California. Hailing from western New York, I have visited the state on a number of occasions, but know very little about California history, so this was a very nice introduction. The book opens with an introduction to Queen Calafia and Her Magic Island. As all good stories begin, this one starts with "Once upon a time (or maybe only yesterday) ..." Readers learn about the Queen and her island, her fury at the use of their island name, and her command to her warriors to let the animals speak for California as she decides the fate of the people. What follows are 26 stories, each told by a different animal, each about a different event, location, industry, animal, or some other important piece related to California history or present. After their stories, readers learn about the judgment that Queen Calafia has made. Back matter in the text contains information about the origin of the Queen Califia legend, additional information about each of the animals and the stories they narrate, and a note about the artist and the content of the borders at the beginning of the book. The illustrations are brightly colored, gloriously vibrant images that are nothing short of magical. I spent almost as much time pouring over the illustrations as I did reading the text. I loved the story of the monarch butterflies, and will use excerpts from this in my science teaching. Other connections to science include stories about the La Brea Tar Pits, Mount Palomar Observatory, and Yosemite. Hansen looks broadly and inclusively at California history. The stories are short, providing just information to pique the interest of readers. I know that I closed the book wanting to know so much more. This is a beautiful book with a story inventively told. This month the Poetry Seven crew wrote in the form of the tritina. The tritina is composed of 3 tercets and a final line (envoi) that stands alone. Similar to a sestina, though shorter, it uses a set of 3 alternating end words instead of six. The form is: ABC / CAB / BCA / A, B, and C (final line/envoi). I think repeating words are hard, so this took some thought. However, it was the final line using all three words at once that proved to be the real challenge. I wrote two poems for this form. The first is a bit melancholy, but that always happens to me at this time of the year. My father’s birthday was yesterday (the 5th). He would have been 90 this year. And tomorrow (the 7th) is the 7th anniversary of his death, so he’s been much on my mind as of late. Therefore, the first poem is for/about him. The second is much lighter. Without further ado, my tritinas. scales, the thrill of catching it sweet. hands. At the end, the world went cold. slammed shut. Now I fish alone--no dad, no largemouth--just cold, sweet stillness. turkey, that some things are set in stone. I’m stone cold sober, so lay some sweet lines on me. Poems ©Tricia Stohr-Hunt, 2016. All rights reserved. I do hope you'll take some time to check out all the wonderful poetic things being shared and collected today by Sylvia Vardell at Poetry for Children. Happy poetry Friday friends! When I was young and learned my father served in the Naval Air Corps during WWII, I became a voracious reader of anything and everything about the war, including the Holocaust, Pearl Harbor, Jackie Robinson, Rosie the Riveter, the WACs, and more. What I didn't find were stories about the Tuskegee Airmen. 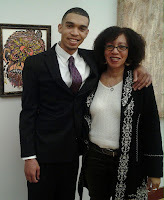 My young self would have been as thrilled as I am today with the release of an amazing poetry collection entitled You Can Fly: The Tuskegee Airmen, written by Carole Boston Weatherford and illustrated by Jeffery Boston Weatherford. You Can Fly: The Tuskegee Airmen is a collaboration between award-winning children’s book author Carole Boston Weatherford and her son, debut illustrator Jeffery Boston Weatherford. They have woven poems and scratchboard illustrations into a history in verse inspired as much by World War II newsreels as by modern day graphic novels. The project was nearly ten years in the making. With starred reviews in Kirkus and Publisher’s Weekly, the book for middle grades is off to a flying start. Here the mother-son/author-illustrator team interview each other. Carole: When did you first hear about the Tuskegee Airmen? Jeffery: I first heard about them when I was a young boy. We took family trips to the Smithsonian Air and Space Museum in Washington and to Tuskegee Institute, Alabama where we toured exhibits about the Tuskegee University’s founder Booker T. Washington, botanist George Washington Carver and the Tuskegee Airmen. I always had dreams of flight. Carole: I first learned of the Tuskegee Airmen in a magazine article in the 1980s. I was so moved by their story that I saved the magazine. My literary mission is to mine the past for family stories, fading traditions and forgotten struggles. The Airmen’s saga is historically and politically significant. As a children’s literature professor, I knew of at least one historical fiction picture book and of several informational books about the Tuskegee Airmen. I felt that the story would lend itself well to a poetic treatment. Carole: Tell us about your family’s military ties? Jeffery: My great great great grandfather Isaac Copper fought in the U.S. Colored Troops during the Civil War. He was one of 17 veterans who founded the town of Unionville on Maryland’s Eastern Shore. My mother’s father Joseph Boston Jr. served in World War II. He was a technical sergeant in the Army Corps of Engineers in New Guinea and the Philippines. My grandmother still has his uniform and medals. Jeffery: Which poem was most challenging to write? Carole: “Operation Prove Them Wrong” was by far the toughest to write. It was like plotting scenes for a war movie. I had to boil down Operation Corkscrew and Operation Diadem to a few lines that captured the battles. It might have been easier if I were gamer like you or at least a World War II buff. Carole: You were a serious gamer growing up. Did your background as a gamer influence how you illustrated the battle scenes? Jeffery: Yes, absolutely. I had lots of residual visual references from battles across galaxies. 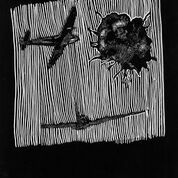 Carole: I like the one opposite the poem “Routines.” It shows a dogfight in which one plane gets bombed and explodes. The explosion is quite animated, like something out of a comic book. I almost want to add an action bubble: Boom! Carole: Describe your creative process. 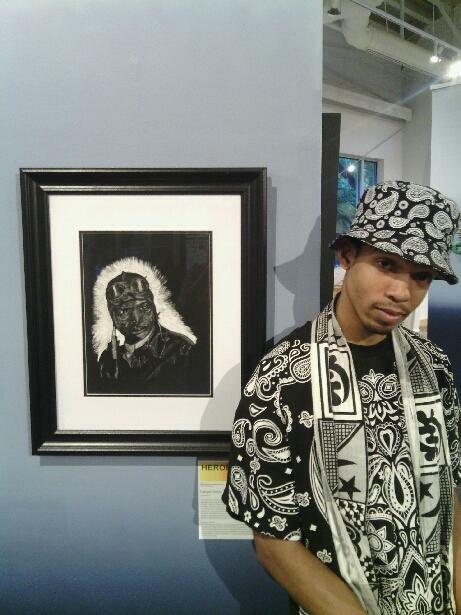 Jeffery: For inspiration, I viewed documentary photographs from the Library of Congress and National Archives collections. While researching picture references, I had some dreams of meeting Tuskegee Airmen. I also watched the movie Red Tails. For each illustration, I drew a graphite study to layout the composition. Once that was completed and approved by the publisher, I refined the image and transferred it to scratchboard. I used various nibs for different effects. Jeffery: What do you want readers to take away from the book? Carole: I want them to be inspired by the courage and determination of the Tuskegee Airmen. I want them to understand that the sky is no limit if they are willing to prepare themselves, practice and persevere. The book aims to lift the ceiling off of young people’s dreams. 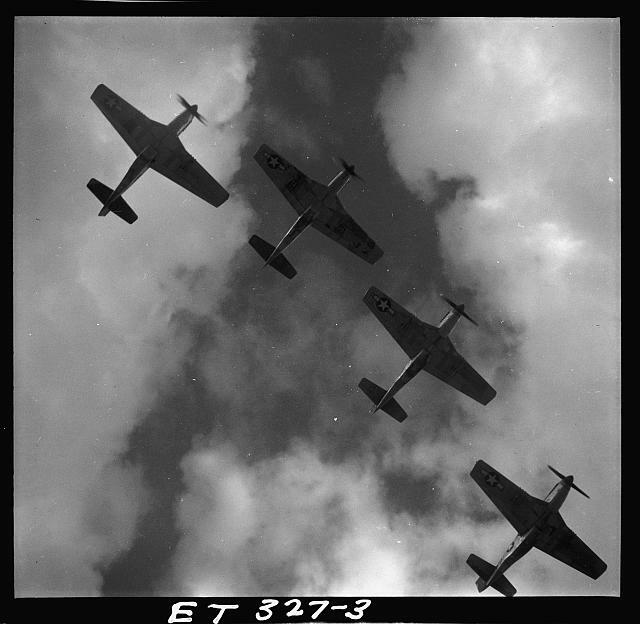 P-51 Mustangs flying in formation over Ramitelli, Italy. Did you know? The Tuskegee Airmen got the name Red Tails when their ground crew painted the tail of the P-47 red. WWII by the numbers: Before the Tuskegee Experiment began, there were only 130 licensed African American pilots in the U.S. Here's one of my favorite poems from the book. is working wonders with sweet potatoes! can surely make you a pilot. with a Bible and a box lunch from your mama. you would never have taken this leap. Poem © Carole Boston Weatherford, 2016. All rights reserved. The poems in this volume are moving, vivid, and packed with information. The poem in the Epilogue describes the race barrier breaking moments that came after the Tuskegee Airmen paved the way for integration of the U.S. military. The backmatter includes an author's note, timeline, and extensive list of additional resources and primary sources. My thanks to Carole and Jeffery for sharing their conversation and their work. 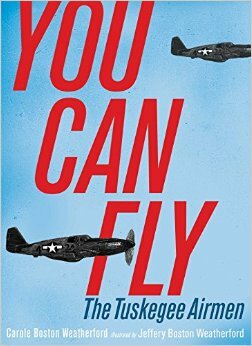 You Can Fly: The Tuskegee Airmen was released on May 3rd and is available now. Don't miss it! Today I'm sharing a form known as ae freslige. Some say it's Irish, others Celtic. Some spell it ae freslige, other ae freslighe. There are even different descriptions of the form. Here are two I've seen. Each stanza is a quatrain of seven syllables. Lines one and three rhyme with a triple (three syllable) rhyme and two and four use a double (two syllable) rhyme. As was stated earlier. the poem should end with the first syllable word or the complete line that it began with. I hope you'll join me today in writing some version of an ae freslige. I love the added challenge provided in the form as escribed by The Poets Garret. Please share a link to your poem or the poem itself in the comments.